The St. Denis Food Pantry in the St. Denis Parish Hall on Grand Army Road in Whitefield is open from 10 a.m. to 3 p.m. the first Friday and 10 a.m. to noon the third Saturday of the month. The pantry serves Whitefield and Alna and welcomes volunteers. For more information, call 582-2684 or 549-3672. The Boothbay Region Pantry at the First Congregational Church, 1 Eastern Ave., Boothbay Harbor, is open from noon to 2 p.m. Fridays. The food pantry serves Boothbay, Boothbay Harbor, and Edgecomb residents. For more information, call 633-4952. A pantry is open from 9-10 a.m. Saturdays at the United Methodist Church, South Side Road, New Harbor. The pantry serves all of Bristol and South Bristol. For more information, call 677-3055 or 677-3424. The churches of the Pemaquid Peninsula Cooperative Ministry accept donations of food, for the pantry at worship. The pantry accepts food donations from 8-9 a.m. Saturdays and monetary donations by mail: P.O. Box 100, New Harbor, 04554. The Ecumenical Food Pantry at The Second Congregational Church in Newcastle is open from 9:30-11 a.m. Tuesdays. Families from Damariscotta, Newcastle, and Nobleboro are welcome. Free diapers are available at the Ecumenical Diaper Bank distribution table. Representatives of the Ecumenical Committee on Homelessness Prevention and Tedford House are available during pantry hours to discuss housing needs. A cook from the FARMS Community Kitchen gives out food samples and recipes. For more information, go to newcastlefoodpantry.org or call Mike Westcott at 563-5597 or Linda Sandefur at 529-6965. The Damariscotta United Methodist Church Pet Pantry is open from 9-11 a.m. on the first Tuesday of the month. Handicapped-accessible. The Jefferson Area Community Food Pantry is open from 4-5:30 p.m. on the second and fourth Wednesdays of the month at the St. Giles Episcopal Church, 72 Gardiner Road, Jefferson, for folks from Jefferson and Somerville in need of food. The director is Aaron Greene-Morse. To donate, send a check with “JACFP” in the memo line to St. Giles church, P.O. Box 34, Jefferson, ME 04348. For more information, call 315-1134. Volunteers may call 530-3769. 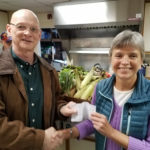 The Waldoboro Food Pantry, in the former Taction building at 251 Jefferson St., is open from 12:30 to 4:30 p.m. on the first and third Tuesday of each month. Those who use the pantry should park in the large lot between the Grange hall and the back of 251 Jefferson St. and use the back entrance. For more information, call 785-4782. St. Philip’s Episcopal Church in Wiscasset runs the Help Yourself Shelf food pantry to serve area residents in need of food and other items. The pantry is open at the church, 12 Hodge St., Wiscasset, at 5 p.m. every Thursday. To donate non-perishable goods, paper products, diapers, other items, or cash (to purchase grocery items through Good Shepherd Food Bank), call the church at 882-7184. Families in need should come for food on any Thursday or, in emergencies, call the church at 882-7184. The Wiscasset Church of the Nazarene Food bank is open from 4:30-5:30 p.m. Wednesdays and 12:30-1:30 p.m. every Sunday. For information about obtaining food boxes before distribution days, call 882-9088.